but still made you curious about how the fight would turn out. I haven't yet read Sean Howe's book, Marvel Comics: The Untold Story, so I'm not really clear on the mechanics of how a story at Marvel gets pitched or by whom, or if one is simply assigned to a book's resident writer. But let's say for the sake of argument that it's the writer who charts the book's direction (or at least contributes to it), and the editor then signs off on the story idea which the writer then works out with the artist. I'm sure that's way over-simplifying it, but let's stick with that for now. MF: I'd like to have Iron Man battle Princess Python. RT: But--she doesn't have any powers. She just has her pet python. MF: Um hmm, I know. RT: So it'll basically be Iron Man vs. a python. MF: And Princess Python, yeah. RT: Iron Man. Pitting his armored might against a python. MF: I can make it work, seriously! 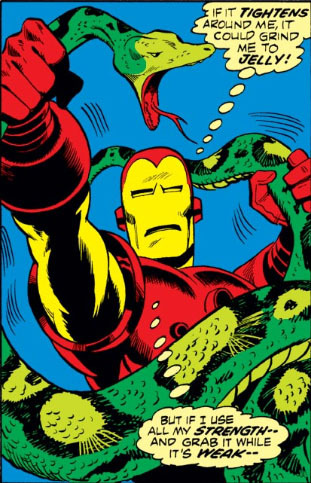 Think of it--Princess Python, going up against Iron Man! 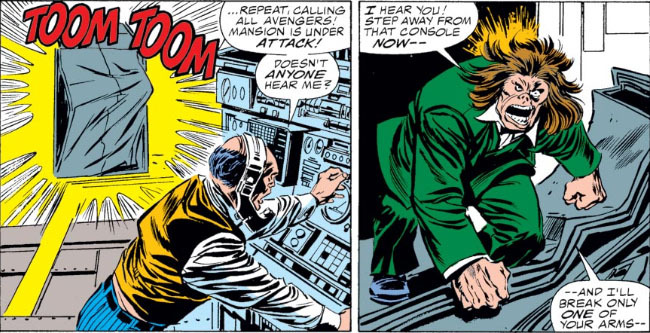 I have to assume that Thomas had to take an important call at that moment and put this meeting on the back burner, because somehow this premise made it into production and appeared in Iron Man #50. Fifty issues of Iron Man, and we find him going up against foes like Princess Python. Whether you can count Iron Man to be a successful title at this point is a matter of perspective, I guess. 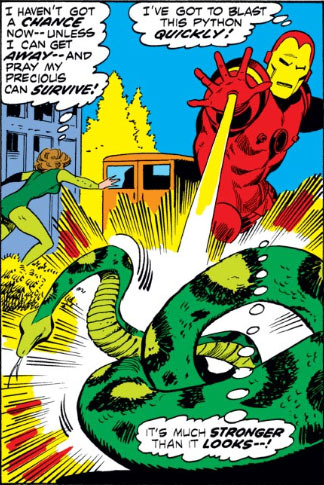 Except that the python is doing its best to crush Iron Man's armor--but unless that armor is crinkling, or bending, or weakening in any way (and it isn't), the man inside that armor isn't being crushed one bit. Not even tickled. And since it wouldn't do Iron Man's rep any good in villain circles if word got around that a python had the strength to damage his armor, we can assume that his armor weathered this "attack" with flying colors. 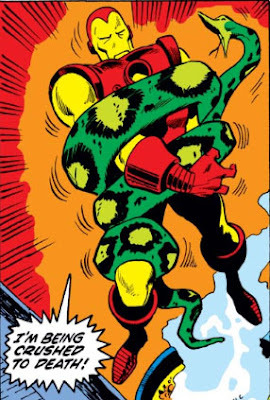 Tell me I didn't just hear Iron Man conclude that he'd need to use "all his strength" to free himself from this python's grip. 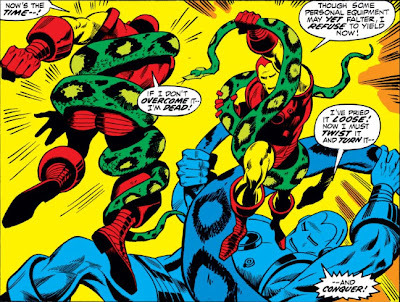 At least we know that if Iron Man ever turns bad, all the military would have to do is send two or three trained pythons against him. I could even name the perfect Princess to head the task force. 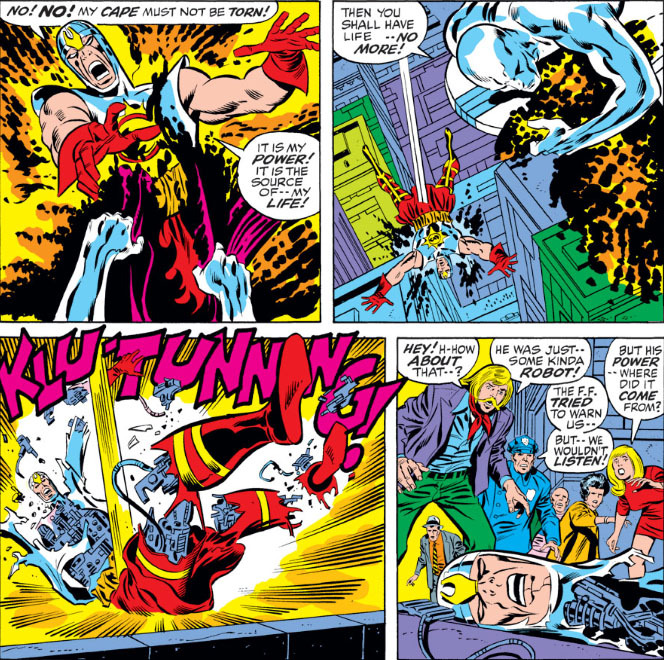 But Iron Man manages to save the Princess, and promises to get her some psychiatric care. Gosh, where will those doctors start? Her criminal history? Her fixation on large deadly snakes? 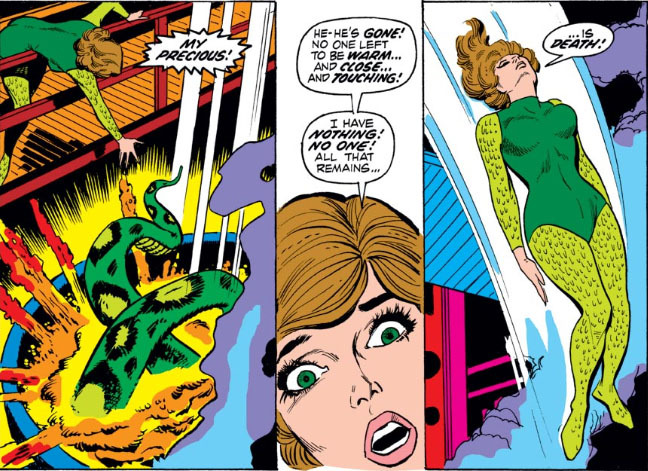 But I know the big question that has to be on everyone's mind: hasn't Princess Python more than proven her ability to take the place of the Mandarin as Iron Man's arch enemy? Assuming she can lay her hands on another python. Iron Man's other enemies may want one of their very own. With this post, I do believe our retrospective on the Grim Reaper will finally reach, you'll excuse the expression, a dead end. Not that he doesn't cause more mischief down the road in other titles; it's just that it's becoming apparent to me with this latest appearance that Marvel is now beating a dead horse where the Reaper is concerned. I mean, what does it take to put this guy six feet under and keep him there? And how many wince-worthy "dead" references can I make at his expense? So I come not to praise the Reaper, but to bury him. Or at least try to. Once the Reaper perished after experiencing "life" as a zombie at the hands of his lover, Nekra, it seemed like there was no more to be gained by further reanimation of him. The Reaper had already come to terms with the twin existence of the Vision and his brother, Simon Williams; unfortunately, when Nekra raised him from the dead, all that he had learned and resolved had been wiped from his memory. At the end of that story, the Reaper--discovering his true state as a zombie--ended his living-dead existence by his own will, choosing the final death over being a walking corpse. With this next story, Nekra is once again responsible for resurrecting Eric Williams, though with a couple of twists. First, he's completely free from being commanded by the Black Talon or any other such voodoo priest; but on the down side, Nekra's spell requires that he absorb a human life every 24 hours in order to remain among the living (if you can call it that). But guess whose life he shockingly takes first? It seems like a pointless diversion. Do you care at all about the Mandrill? Join the club. 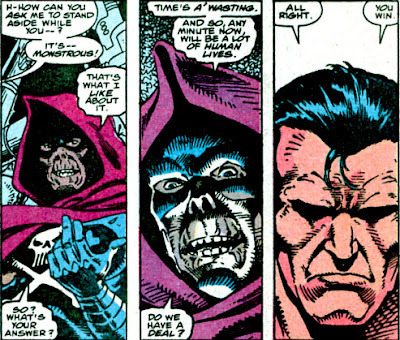 Yet instead of attacking Ultron, the Reaper only confronts him--and in doing so, a strange alliance is formed. 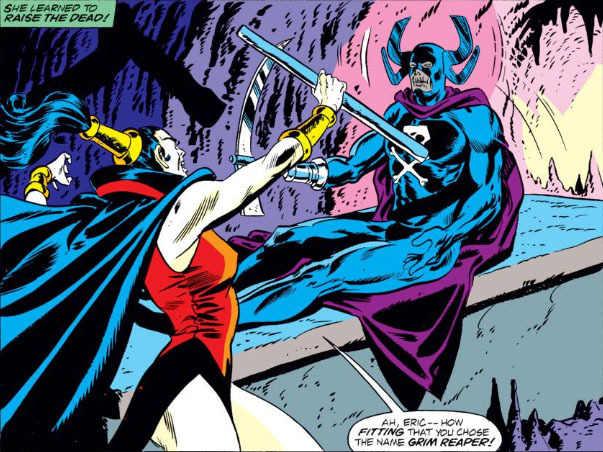 First, Ultron takes the opportunity to permanently fuse the Reaper's scythe to his arm; then, he offers the Reaper the opportunity to serve him, which the Reaper inexplicably accepts. It's a head-scratching scene, considering that both of these beings has more to lose in this alliance than to gain. Ultron has discovered the Reaper can slash even his indestructible body; and the Reaper is in danger of losing his only means of survival if Ultron succeeds in turning all of humanity into metal beings. 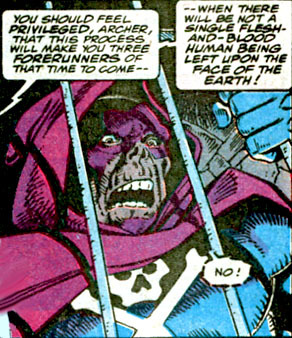 In fact, when Ultron mentions that very point to the Reaper, he brushes off his predicament in a way meant to change the subject. 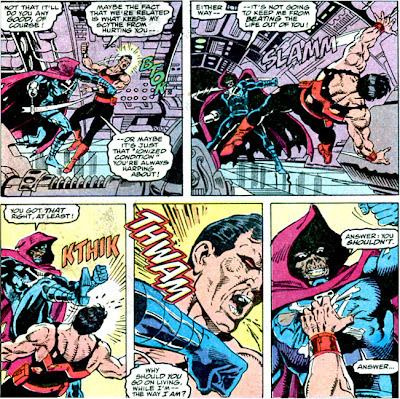 At that point, both the Avengers and Ultron intervene, eventually resulting in a collision between Ultron and the Reaper which incapacitates them both. And the Grim Reaper no doubt will "live" to fight another day. But I'm afraid you're on your own as far as reading about his further exploits. For me, whatever interest I had in the Grim Reaper ended here. His motivations vis-à-vis his brother Simon really came to an end when he jumped to his death; though, really, the Grim Reaper as a character has a much more fitting ending at the trial he concocts, where he comes to know the reality of Simon's existence yet cannot put aside his enmity for the Vision. At that point, his main reason for coming after the Avengers is rendered moot, at least on a personal level--and what came next with his mad plan to create a "new" brother was more follow-up on this issue than was really needed. Now the Reaper is just a ghoul--with Wonder Man the only one keeping the "brothers" aspect of the story alive in any sense, since the Reaper in his present form has no remaining feelings of family ties whatsoever. Now that Marvel is rebooting all over the place, perhaps the Grim Reaper can have a second life--but his first one has more than played itself out. 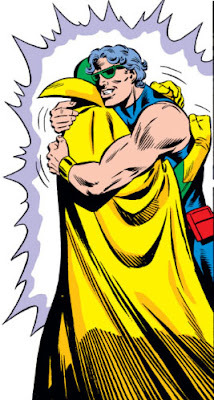 I think I've mentioned once or twice before how the original Defenders group could realistically have only a short shelf life--that it could only be a matter of time before these three individuals would have to part company and return to their very separate lives. 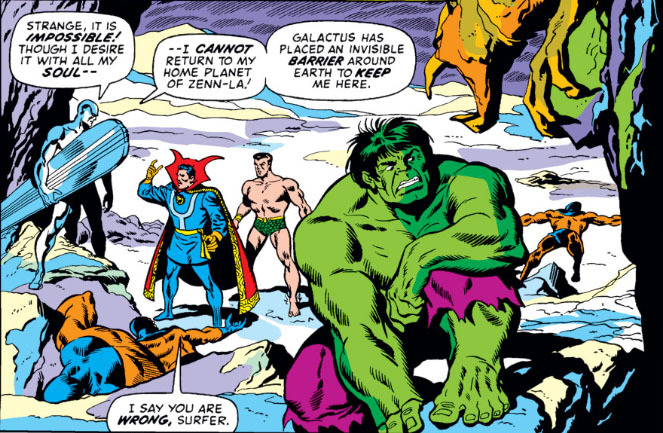 With the informal addition of the Silver Surfer, any hope that they could make a lasting commitment to band together seemed to become even more unlikely. 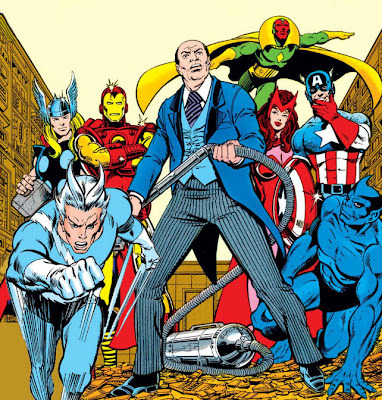 This one picture of the original Defenders seems as natural as any team formation I've seen in comics. Yet I'd stop far short of formalizing their association as a "team"; if we must put a word to their gathering, perhaps "comrades" would be more descriptive of their decision to band together. No aversion to working together when the situation warrants a joining of forces--yet no wish to make a commitment beyond the immediate need. If a series could be built on that premise, it would surely have to be a limited one. 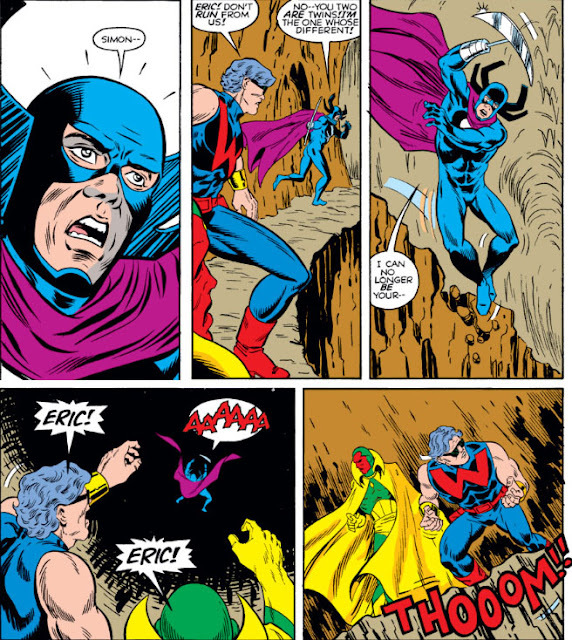 That said, writer Steve Englehart makes a remarkable effort in these initial issues, though even that exhausts itself during his tenure on the book. That's why the first three issues of The Defenders not only stand out from the entire series, but also stand alongside the ranks of Marvel's other titles in the early 1970s that are giving the company its second wind. 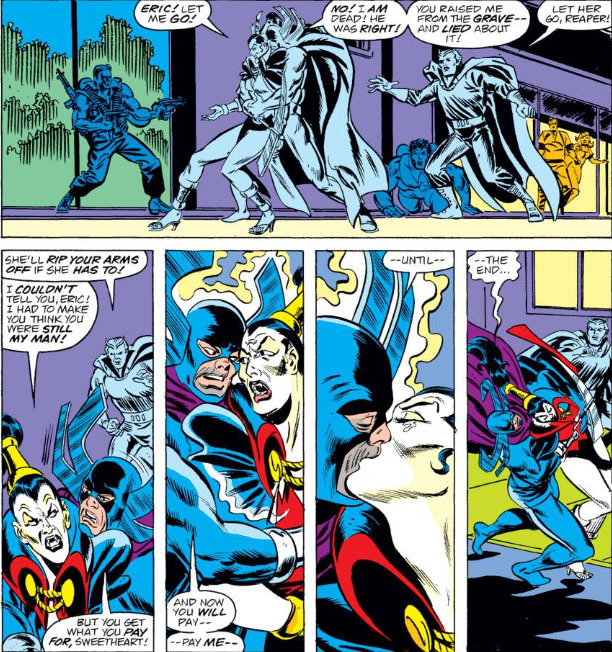 And from what Englehart presents us with in these early Defenders stories, we had every indication that this new series would be something unique and memorable. 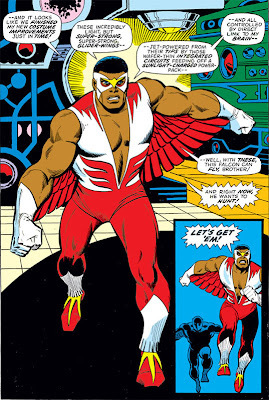 So that takes care of the Falcon--and the adventures of himself and Cap take on a more balanced feel, as expected. 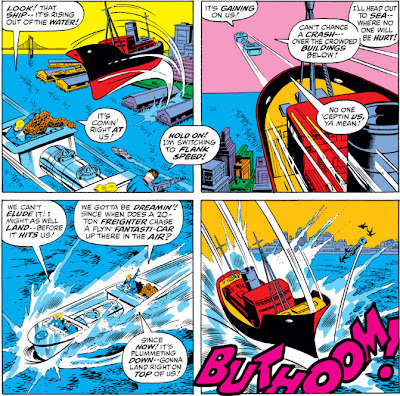 But when artist/writer Jack Kirby takes the reins of Cap's book, he retains some elements of prior storylines but disregards others--an example of the latter being Cap's super-strength, which for all intents and purposes never happened, with Kirby preferring Cap to rely on his own abilities which have served him so well over the years and admittedly made a better "fit" for the character. Yet Kirby not only keeps the Falcon around, but his artificial wings are in full display--wings which would never have come into existence had it not been for Cap's super-strength. "...what about that extra super-strength Cap gained a couple of years back? Should he keep (regain) it, or do you prefer the 'mere' perfect fighting-machine of an earlier period. Roy, Don, and Sal would truly appreciate hearing from as many Cap-boosters as possible on the subject--and as quickly as possible, too, before they commit themselves either way! We'll try to devote a letters-page in a couple of months (about #221 or thereabouts) [Ed. 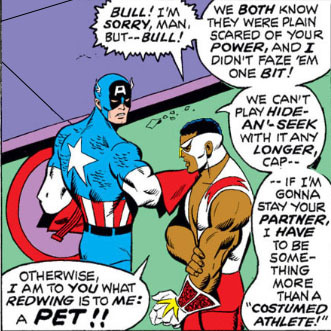 : four issues away] primarily to comments for and against Cap's super-strength... and who knows? We may even give away a nostalgia-producing no-prize or two!" "Steve feels that most of the supporting players in earlier issues of CA&F--Sharon Carter, the Agents of Shield, etc.--have about had their day. He would like to endow the magazine with a new cast of characters, a different type of plotline, and, generally, a whole new look to see it gracefully into the 1980's." 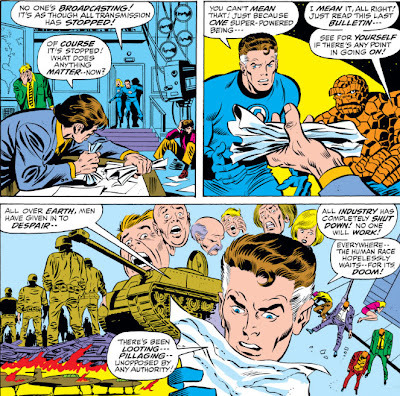 As for Cap's super-strength, I don't recall seeing any of those solicited letters from readers appearing in subsequent letters pages, so we can probably assume that they were pitched into the trash on sight, given how awkward it would have looked to publish them when a decision on the matter had already been made months before. 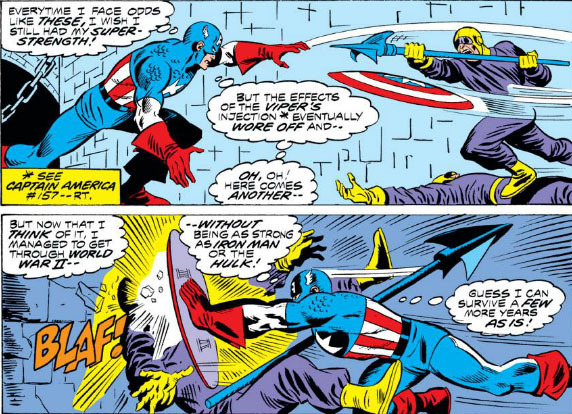 Nor did it seem that anyone minded that Cap was back to "super-soldier" level in fighting strength, which still made for dynamic fight scenes. Captain America in my opinion works best in a story when he prevails by his strength of character rather than a punch to the jaw--because getting that punch to connect to the jaw means having Cap overcome the odds being stacked against him, combined with a fighting spirit that's fueled by an innate responsibility to save lives and to do the right thing. 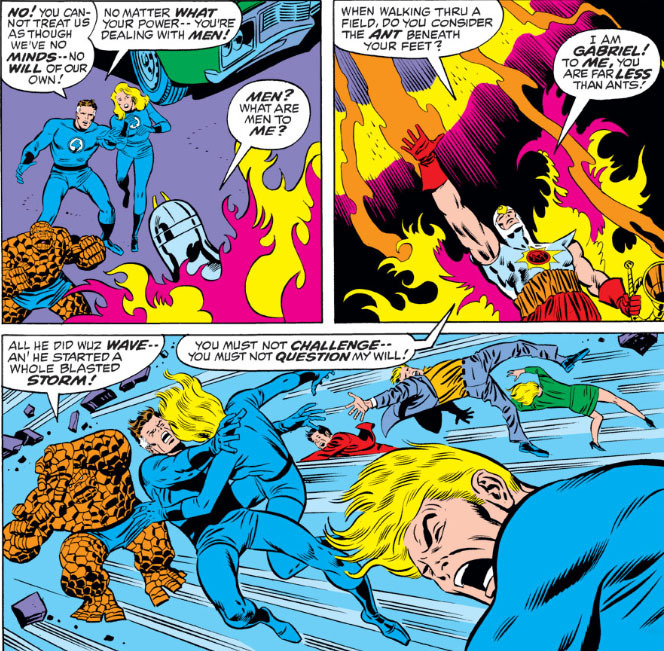 There's a difference between "Captain America prevails" and "Captain America mows down the opposition," and in that respect there's really no need for super-strength in this super-soldier. 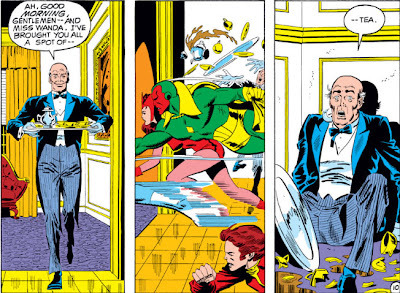 OR: "Pay No Attention To That Butler Behind The Cowl"
What made Jarvis betray the Avengers? Things looked pretty grim for the Grim Reaper the last time we checked in on him, didn't they? I mean, you can't get much grimmer than being impaled on a stalagmite after plummeting to your death. 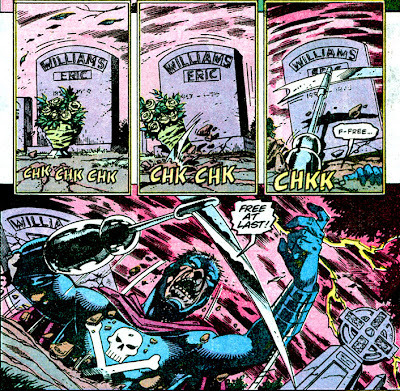 But from his final words in that story, at least we can hopefully conclude that Eric Williams came to terms with his brother Simon's existence, as well as the unique bond that Simon shares with the Vision. Nekra also reanimated the corpse of the man that the Reaper had intended to take Simon's place--Brady Kent, a paid assassin for the Boston mob who apparently was assassinated himself after slipping up on a job. 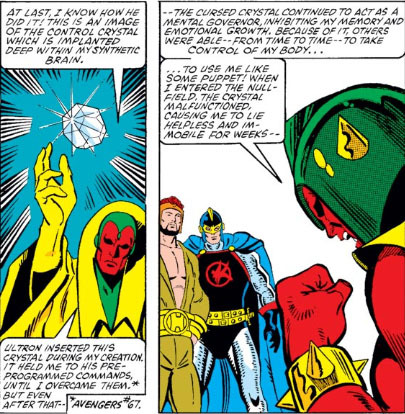 The Reaper's original plan (to sift through the thoughts of the Vision and Wonder Man and then transfer their essence to Kent's mind) had been abandoned; but Nekra needed manpower to take revenge against the Vision, who at this point in time was attending to Wanda while she prepared to give birth. Of course, the Reaper was ignorant of his own reanimation at the hands of Nekra. 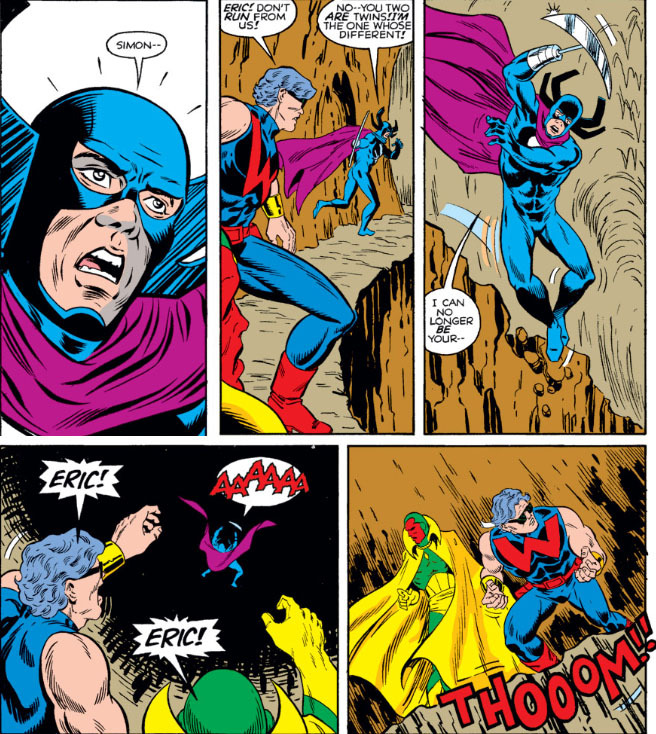 Unfortunately, he'd also forgotten the epiphany he'd experienced regarding Wonder Man and the Vision prior to his suicide, and so still despised each of them for the same reasons. So he and his scythe, along with Kent and his proficiency with firearms, were enough for Nekra to begin her plans of revenge. With her power to hate the only thing maintaining the Reaper's semblance of life, Nekra's loving embrace with him proves to be fatal to Eric, and he collapses. I've no idea why Kent stays up and fighting--though not for long, as Wonder Man and Magneto subdue him easily enough. 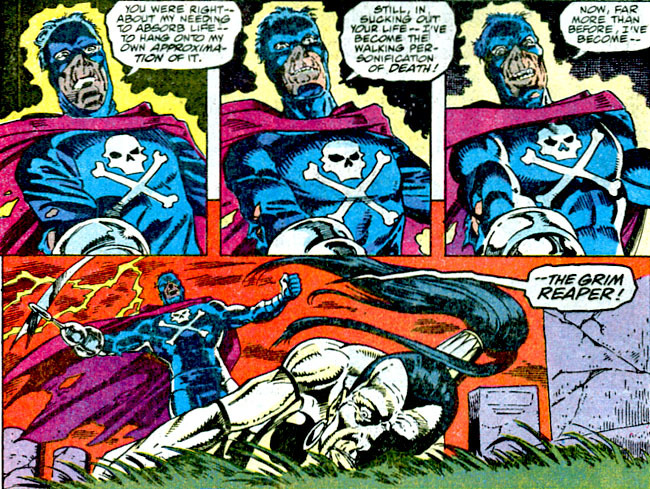 Then the two go to share the Vison's and Wanda's joy, with the Grim Reaper finally on his way to a bona fide grave. Which should finally, finally bring this saga of the Grim Reaper's mad revenge to a close, right? How much blood can Marvel expect to squeeze from this stone, anyway? 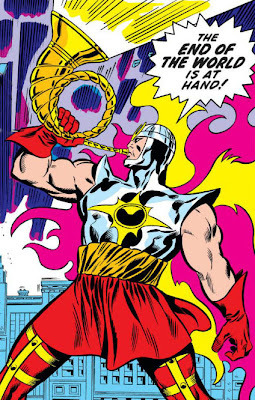 And we couldn't pick a better time to revisit the story of this particular herald of doomsday, appearing over forty years ago when Fantastic Four #121 told the story of the "Air-Walker"--a mysterious figure who appeared in the skies of the world and crisscrossed the globe, surveying the inhabitants without a word. After a dire warning from Agatha Harkness of the danger he represented, the FF were compelled to investigate, and lured him to their headquarters in New York. Good grief, Sue--how many hopeless situations have you faced in your time with this group? 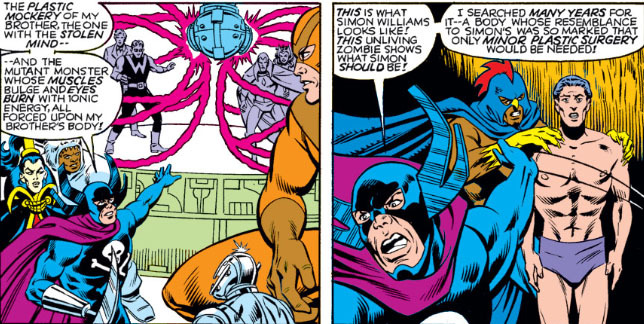 Alone against Klaw or one of the Thinker's deadly androids? Facing off against a cosmic-powered Dr. Doom? Left on your own to deal with the threat of the Over-Mind? And you're ready to throw in the towel just when the FF is getting its second wind? How about a morale boost, for a change, instead of sucking it out of your team like a sponge? "I might as well land--before it hits us!"?? So--it won't hit you, now that you've landed and become a stationary target? And by the way, wouldn't this be a good time for one of those force fields, Sue? Or maybe turning the Fantasti-Car and its occupants invisible? 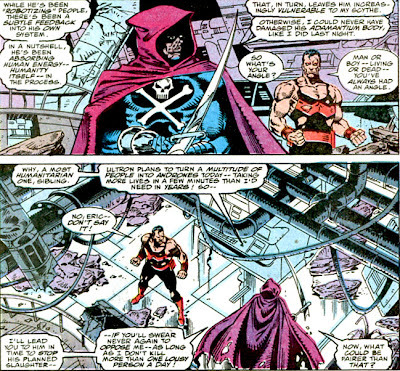 The final page of the issue reveals Gabriel's true master, a threat the Earth has faced before and who's also been known to use a herald to warn a world of its end. 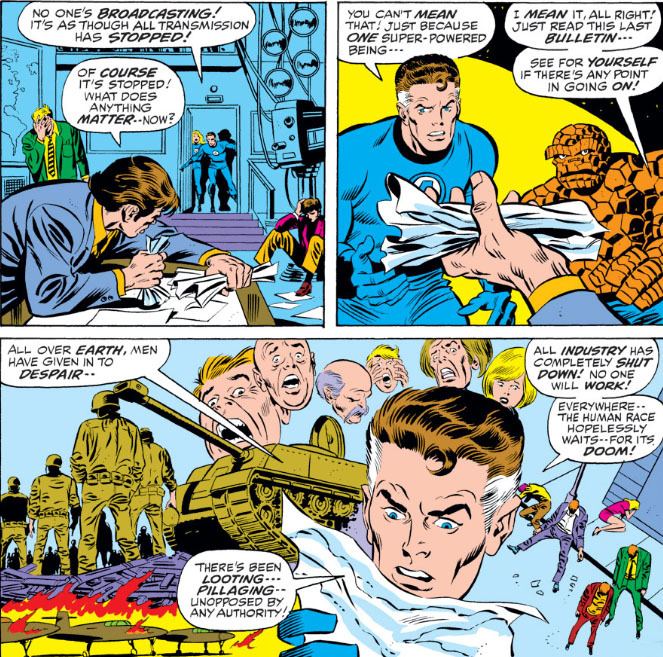 It was the careful planning of Reed Richards that saved the human race that day, while also allowing us to retain some measure of dignity. Perhaps we can reclaim some of that ourselves, now that the more fearful among us can replace the dread of an imminent doom with hopefully the optimism of a brighter future. 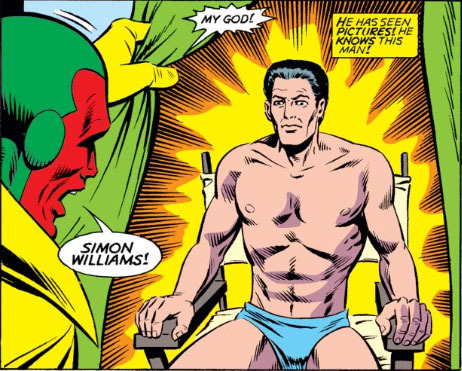 Quite a lot has happened since the Grim Reaper conducted his bizarre little trial to determine in which of two men--Wonder Man or the Vision--the identity of his brother resides. Some 90 issues have gone by, a little over seven years in real time. A new team of Avengers has been established on the U.S. west coast, with Wonder Man one of their charter members. 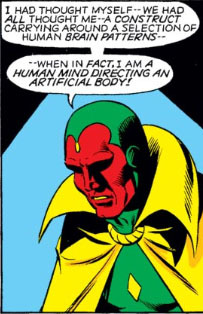 The Vision, due to a complication from a control crystal implanted into his head by Ultron, has attempted a world takeover by infiltrating the planet's computers. And when that situation was resolved, he and the Scarlet Witch left the Avengers to start a life for themselves. And who better to put that to the test than the Grim Reaper, who has dogged and mocked the Vision's humanity for awhile now? 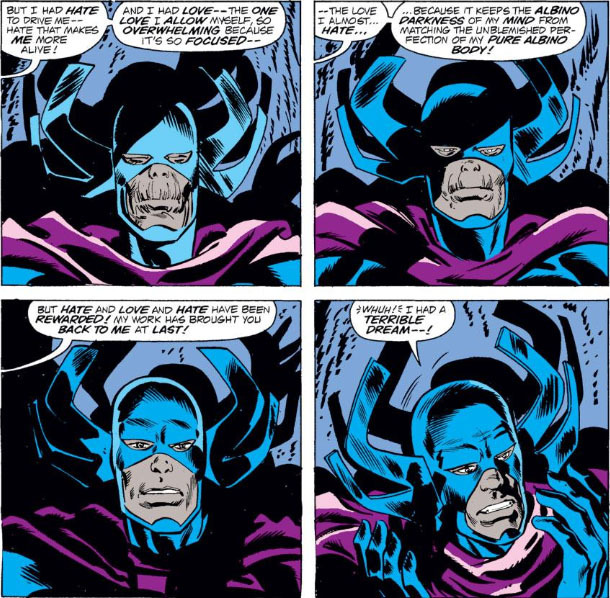 Because as much as the Vision is at peace with himself since coming into his own, the Reaper is far from being at ease with either the Vision or Wonder Man. 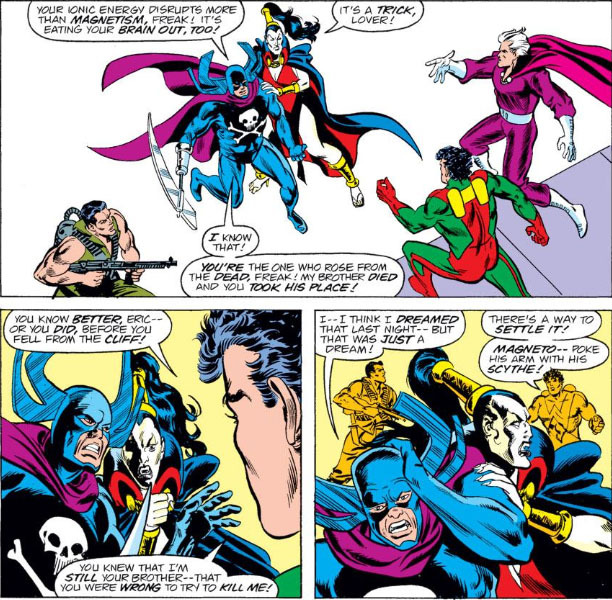 When last we left the Reaper, he was ready to execute the Vision because he was convinced that Wonder Man was his brother, Simon--yet, in some cruel jest, not his brother, since the process that made him Wonder Man had mutated him into another form of life. And the Reaper, who has proven to be a bigot, insists on a wholly human brother or nothing. Oh, and the Black Talon's zombie army. 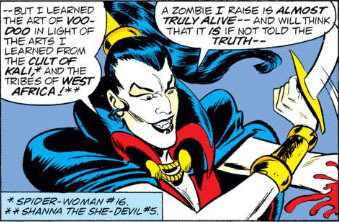 And get this, they're not called "zuvembies" anymore--finally Marvel gets with the program. Who knows, maybe the "Maggia" will finally be known as the Mafia. A guy can hope. 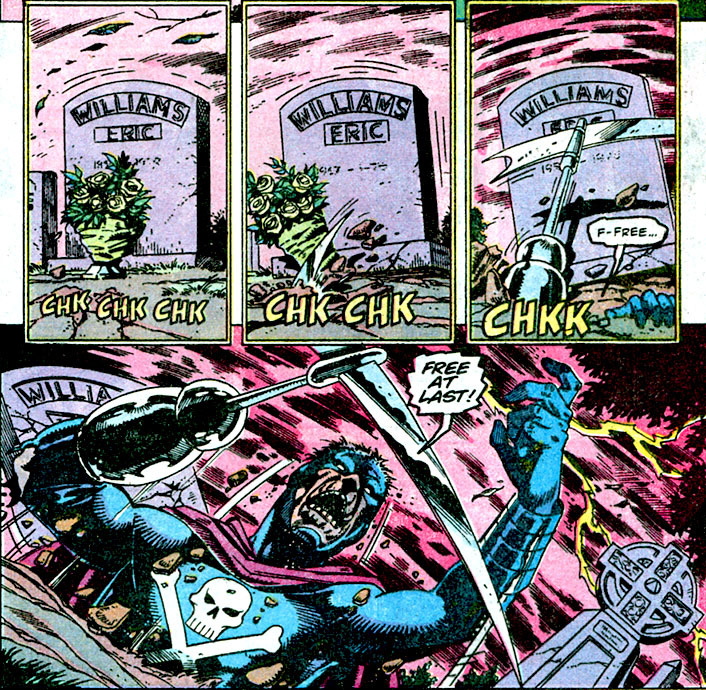 With stalagmites lining the cavern ground below, make no mistake--Eric Williams, the Grim Reaper, is DEAD. Just how do you think he's going to feel about that next time? What Does The Beetle See In Aunt May?